Successfully printed the planetary gears without needing to sand the parts afterward. Found that 0.1mm layer height at 235 degrees C and 65 degrees heated bed on my Ender 3 using Amazon Basics PLA gave me perfect results. I had to use a raft to get the gears to have a perfect base. Without the raft, you get a mushy effect on the bottom of the gear which is painful to clean up with filing. I also randomized the "Z seam alignment" rather than using Cura's default "Sharpest Corner" to get the print as smooth as possible. The fit is tight when assembling, but breaking in each planet gear one by one by running the stepper motor for about 10 minutes per gear seemed to do the trick. I got the airsoft 6mm bb's and those work great. Since I only had NEMA 17 stepper motors with full shafts, rather than flat shafts, I did drill out the sun gear with a 5mm drill bit to get it to fit while I wait for the new NEMA 17's. I'd love to still get the original CAD files so I could create a modified sun gear. To drive the stepper motors I used a couple ESP32's running the NodeMCU Lua environment to create step signals from the I2S bus. I added a couple of buttons to stop/start the motors and reverse directions to make testing/breaking in the gears easy. I'm using a DRV8825 chip to drive the steppers. Update: printed another large actuator with 0.06mm layer height and the fit was amazing at 100% size on the planetary gears. Also, finally printed the small actuator at the 0.06mm layer height and that worked pretty well. I got the Moon's small stepper motors delivered, crazy glued the shaft to the main sun gear. I'm finding that the DRV8825 stepper motor drivers I'm using are pumping too much current into the small stepper. It only takes 150ma and getting those drivers to accurately only pump that low of current is tough. May have to move to a DRV8824 driver. 0.1mm on actuators. 0.2mm on body parts. 0.006mm layer on small actuators with 0.3 nozzle. Printed one part per day. Do you have heat issues with your smaller micro steppers and the DRV? What voltage are you running the system at? I'm at 19v and the DRV's at the minimum they'll go until even the motor without the gearbox won't run, and they get damn hot. They warped the Ring48H40. I'm in the process of reprinting them out of ABS. Yes, I do have heat issues like that. I did find that if I cranked the variable resistor as low as I could go without stalling I could get into a reasonable spot, but I also have to put the stepper to sleep immediately after a move because the standstill position would create huge heat. The DRV8824 is probably better for this since the small stepper is only 150mA continuous current and the DRV8825 is not good at that low of a current, so I think it's pushing in like 600mA instead and that's the problem. I'm playing around with a Trinamic TMC2130 this weekend to see if that performs better. So far it seems ok, but it's hard to get the StallGuard2 feature to work for sensorless homing on the small steppers because it doesn't have enough current to measure for a reasonable trigger of sensorless homing. So, I may have to abandon the TMC2130 and move back to a traditional stepper and use a hall sensor for the endstop. Thought I could get away without a hall sensor. I don't like that the TMC2130 is $5 per actuator either. Even at the rated current (regardless of the driver), based on the resistance of the motor, it's generating 2 watts of heat which is a ton for that little guy.. I think I'll put it to sleep right away as well, that's a good idea, thanks for that. You might want to check out http://chilipeppr.com/arm to see if you could fork a workspace of your own to control your arm using your approach of using 5 wires to each actuator with your shift registers. I could help get you started with your own workspace if you'd like. I think we're all trying different ways of driving the robot, but all of us making useful widgets in the browser would be great collaboration. I think I have a great start with all the 3D work I already did and of course with the years of work it's taken to create ChiliPeppr. For now though I'm going to continue re-printing these mini gearboxes in abs :( I taught the arm a quick routine last night, and right as it finished, the wrist joints just started sagging. I knew it wouldn't be a fun fix when I saw them rotating under the weight of gravity! I saw that earlier actually, very cool! I will definitely get it up and working, looks easy enough. Similarly, I rigged it up in Blender and then wrote a quick python script to blast out the coordinates to the teensy for interpretation. Hmm, not sure totally how I'll use the arm. I first need to see with how much weight it can carry to determine practical uses. I do a lot of PCB assembly, so thinking that could put things on/off from my CNC machine. Pretty lightweight stuff, so the arm should do fine. It kind of comes down to accuracy, making end grippers, etc. I kind of like the idea of pick and place the most. Hi, I ordered the custom pcb from JLCPCB, but i think i got something wrong. On the preview it said that the shown pcb may differ from the actual one, but it actually was the one below (pictures). Are there some settings one should add when ordering? Oh no, I screwed up and put the wrong files in that folder on Github. I put the newest PCB rather than the PCB I showed in that Part 2 video. The PCB you ordered may be useful if I don't change the design, but to mimic the PCB in the video you need to do the "adapter_2019-02-11v3.zip" that I just uploaded after seeing your post. Sorry about that. No problem, i wouldn't have been able to manage this project without your help to beginn with :P. New PCB is already on its way. I don't think that will work. 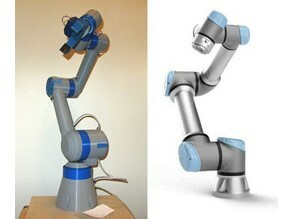 I think the accuracy of this robot arm will be 5mm or worse which is awful for 3d printing. The more accurate you print the gears the better, but they will also wear down. Yes, still working on it though. I don't really have any code yet since I'm designing a pcb for the small actuators first. It is turning out to be really tough. Awesome, just saw your Part 2 Video! Thank you for sharing your work!! Nice build and thorough explanation..